Gujarat on Saturday held the first of its two-phase polling, registering 68 per cent voting, which is expected to cross 70 per cent -- similar to the 2012 figure. NEW DELHI: Gujarat on Saturday held the first of its two-phase polling, registering 68 per cent voting, which is expected to cross 70 per cent -- similar to the 2012 figure. The election was peaceful, barring some incidents of skirmishes, while around 100 complaints of EVM malfunctioning were received. Till late in the evening, the Chief Electoral Officer (CEO), Gujarat office, B.B. Swain was still gathering data on the final polling figures for the first phase, that will decide the fate of 977 candidates for 89 Assembly seats in 19 districts of Saurashtra-Kutch and South Gujarat. Barring two or three incidents, the first phase went off peacefully. "We are very happy that despite apprehensions, everywhere the elections were carried out very peacefully, except a couple of incidents, but that too were outside the polling booths," said CEO, Gujarat, Swain. In Amod near Jambusar, a voter told the Returning Officer (RO) that the Voter Verified Paper Audit Trail (VVPAT) was showing a different voting preference than the one for which he had voted. When the RO asked him to file a written complaint, he refused. The final hour of ballotting saw an increase of about 10 per cent voting. In Amreli, in the last hour it increased from 56.38 to 67 per cent, while in Rajkot at 4 p.m. it was 60.32 per cent which increased to 70 at close of polling at 5 p.m. Similarly, about 10 per cent increase was seen in Devbhoomi Dwarka where it was 53.54 per cent, and rose to 63. In Surat, it was 60.64 per cent at 4 p.m. and rose to 70 after an hour. The polling was carried out even after the declared time of 5 p.m. as people were still lined up in queues at polling booths, which went on till 6.30 p.m. Both the BJP and Congress claimed to have an edge over the other at the end of the day. "The kind of analysis and information that we are receiving, BJP is slated for a big win. This will be a landslide victory for the party," Finance Minister and election in-charge for BJP in Gujarat Arun Jaitley said. Paresh Dhanani, candidate and sitting MLA from Congress from Amreli in Saurashtra, said, "I think the people have voted to free Gujarat from fear, hunger and the corrupt rule of BJP and help Congress win." Among the important places that went to polls on Saturday includes Surat, accounting for 16 seats. In the last polls in 2012, BJP had grabbed 15 of these. Surat witnessed several agitations in the past two years, first by the Patel community and then over the GST by textile traders. While the Congress is hoping to retain its Mandvi (ST) seat in Surat and make a dent in the BJP bastion, as Patels hold sway in constituencies as Varachha, Kapodara, Kamrej and Surat (North), the saffron party is hoping that the constituency profile of voters would help it manage and minimize the damage. The youngest legislator in Gujarat Assembly, 31-year-old Harsh Sanghvi, is contesting from Majura Assembly segment of Surat. The Bharuch district in South Gujarat, from where senior Congressman Ahmed Patel hails, also went to polls in the first phase. The electorate in the district voted to elect five representatives. Tribal strongman Chhotu Vasava of Bharatiya Tribal Party is fighting to retain this seat for the seventh time. In Saurashtra, it was a matter of prestige for Chief Minister Vijay Rupani to retain Rajkot (West) seat held by his party for last 32 years. He was challenged by the richest candidate in the fray and Congressman Indranil Rajyaguru, who had begun campaigning in the constituency for over a year-and-a-half and had challenged to contest Rupani from whichever constituency he contested. The profile of this constituency is such that Karnataka Governor and once legislator from this constituency, Vajubhai Vala, had flown down from Bengaluru to cast his vote. The fate of BJP chief Jitu Vaghani too was sealed from Bhavnagar (West) constituency. Though the caste equations in the seat favour him over his Congress rival Dilipsinh Gohil, the issue of anti-incumbency and anger of Patels could make his ride rough. 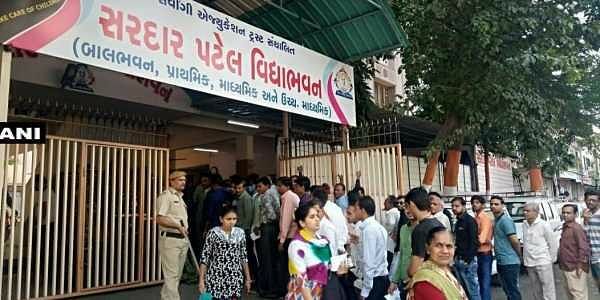 Rajkot which is known for its 'siesta time' from 1 to 4 in the afternoon, registered high voting with people in large numbers queuing up in the afternoon to vote. Rajkot's Visavadar saw their voter, former Chief Minister Keshubhai Patel, exercise his rights coming all the way from his residence in Gandhinagar. Villagers of Limdi village in Surendranagar district have boycotted the elections over their various grievances. The second phase of the state assembly elections will be on December 14. Counting of votes will be on the December 18 along with that of Himachal Pradesh. In New Delhi, Deputy Election Commissioner Umesh Sinha said that there were some complaints of Electronic Voting Machines being connected to Bluetooth, but it was found to be "totally false". He also said that it was the first time EVMs with VVPAT were used on such a large scale.